Saw a version of this mug today during a meeting with my line-manager and my first thought was “haha”, but it got me thinking enough to merit writing something. I had a funny eye test the other week where I was trying to articulate to a male student optometrist (in a way that I hoped wouldn’t compromise my masculinity beyond all doubt) that it hurts me when I cry. Of course, you might think that when it hurts, that’s when you cry, but I mean that it causes me physical pain to cry. I don’t cry as much as I should, but when it ought to be happening, I get a stinging sensation in my eyes that makes me need to rub them and prod at them to try and get that sensation away. The medical explanation for it is that I have what they call ‘dry-eye’ syndrome – something that seems to be exacerbated by constantly staring at screens and not enough time staring wistfully into the distance (doctors’ orders!). They suggested that I get some eye drops, gave me a leaflet and continued with the eye test. 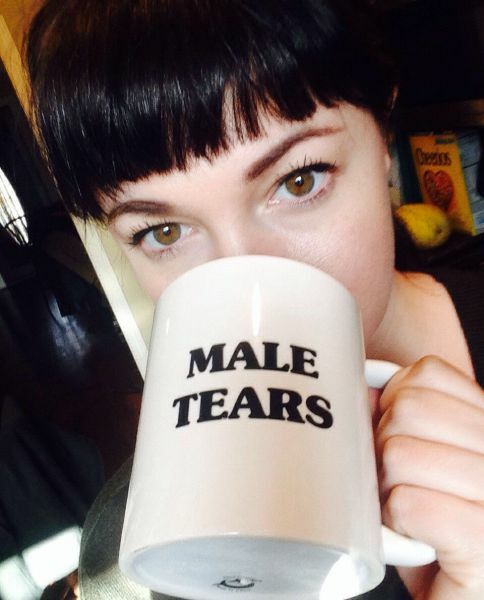 Of course, there is also a psychological thing around the difficulty of crying which is related to how men are socialised and taught to (not) deal with their painful emotions by bottling them up and stuffing them back down and generally not mentioning them or acknowledging their existence. As aware as I am of the negative consequences of this for men as a group and society as a whole, I’m not able to rationalise myself into painlessly shedding tears. I can’t help but feel that my body is causing me to react this way as a physical symptom representing the psychological challenge of allowing myself to cry. In the last year, I’ve had legitimate reason to cry in a way and place that would be socially acceptable but still didn’t feel able to let go. Simultaneously, I’ve found myself crying at happy / inconsequential / inspiring videos and music with the associated itchy, sore feelings. It’s frustrating because I believe a full-on sobfest might be quite cathartic. 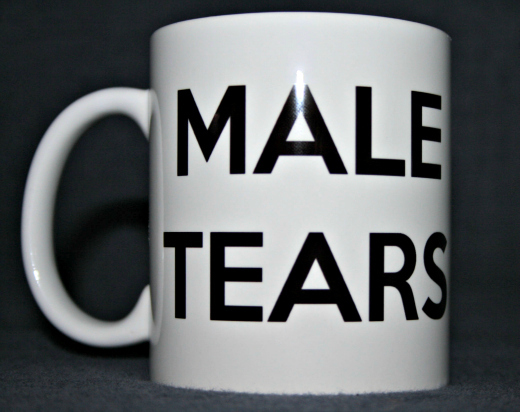 The other thing that made me think is that when I went looking for an image of this mug, I realised that it’s a funny and legitimate response to the stupid Mens’ Rights movement and their stupid activists. It must be pretty hard to sympathise with dickheads who are trying to legitimise your oppression. That said, not all men are. To make fun of all men’s inability to express themselves in a vulnerable way makes it harder for men to express themselves full stop. It alienates the ones who might be on your side and ultimately reinforces the status quo. Thus the patriarchy continues. 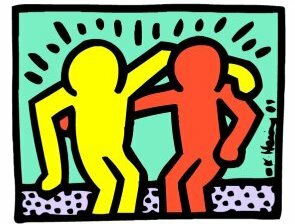 I think that perhaps the only way forward is for more full and frank communication. Unfortunately, it’s totally apparent that the people who need to do the most work on communicating their feelings are the worst at it and are actively discouraged from doing so by mainstream society. Brené Brown talked about shame and vulnerability really powerfully in an episode of On Being back in January. The story that blew me away starts at 20:46, but the whole episode is worth listening to. Ms. Brown: But the messages and expectations that fuel shame, the messages and expectations that bring us to our knees, are so organized by gender. You know, for women, it’s really about do it all, do it perfectly and make sure you make it look effortless. Ms. Tippett: Right. It’s also about how we look, right? I mean, part of that is, and look great while you’re doing it too. Ms. Brown: Oh, yeah, absolutely, no question. I mean, that’s the part that better look effortless. Appearance and body image is still the number one shame trigger for women. For men, there’s a really kind of singular, suffocating expectation and that is do not be perceived as weak. So for men, the perception of weakness is often very shaming and that one of the things that’s interesting is, I talk to men and, you know, what I heard over and over was some variation of, look, my wife, my girlfriend, whomever, they say be afraid, they tell me, you know, share your vulnerability with me, open up, but the truth is, they can’t stomach it. The truth is that, when I’m very vulnerable, when I’m in fear, when I talk about it openly, it permanently changes the dynamics in our relationship. And when I started sharing this with women or whenever I started interviewing couples, women are like, oh, God, it’s true. I want you to be open and I want there to be intimacy, but I don’t want you to go there. You know, and so, I’ve come to this belief that, if you show me a woman who can sit with a man in real vulnerability, in deep fear, and be with him in it, I will show you a woman who, A, has done her work and, B, does not derive her power from that man. And if you show me a man who can sit with a woman in deep struggle and vulnerability and not try to fix it, but just hear her and be with her and hold space for it, I’ll show you a guy who’s done his work and a man who doesn’t derive his power from controlling and fixing everything. This looks like it’s going to be a fantastic documentary. I hope it gets a UK release or there’s some way that we can all watch it on this side of the Atlantic.